Sarcococca is a species of winter-flowering evergreen shrub, named from the Greek – sarka (flesh) + kokkos (berry) for its fleshy fruits. The Christmas Box adapts to many situations, & is recommended for shade. 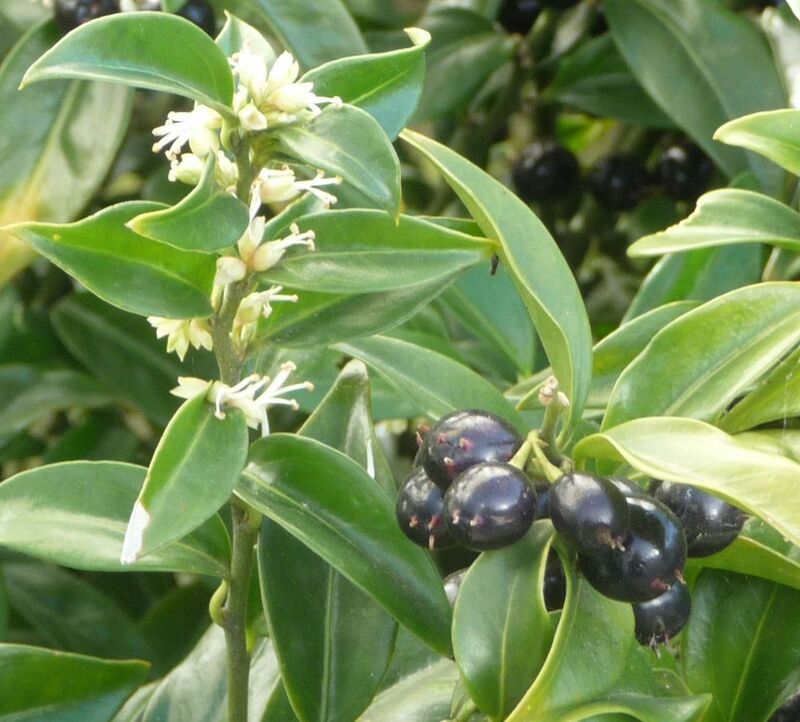 Its CREAMY WHITE blossoms are succeeded by black berries. At Capel Manor Enfield, where I did my gardening course, our class walked out into the grounds one cold, crisp winter’s day. We rounded a corner of the main building & the intensely sweet fragrance of a large, flowering gumdrop-shaped Christmas Box virtually knocked our socks off. 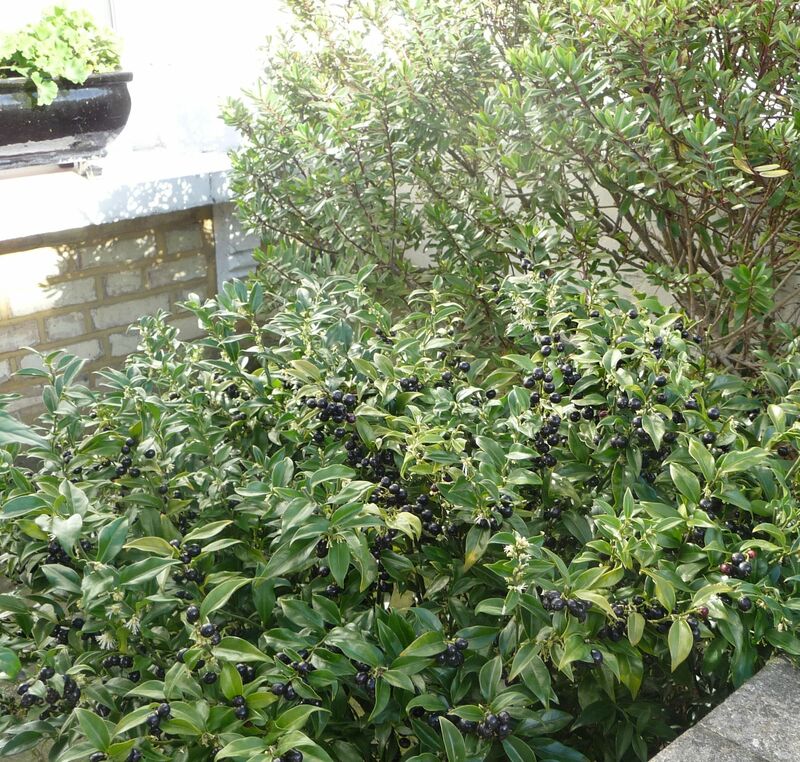 Fabulous perfume in the open air, all round the shrub. Christmas Box in rock garden, Gillespie Park, February 2016. 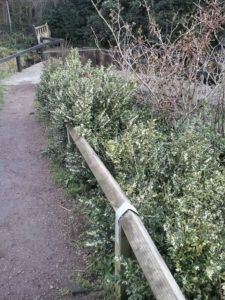 A line of Sarcococca shrubs has been planted behind the Ecology Centre in Gillespie Park, along the steps at the edge of the rock garden. 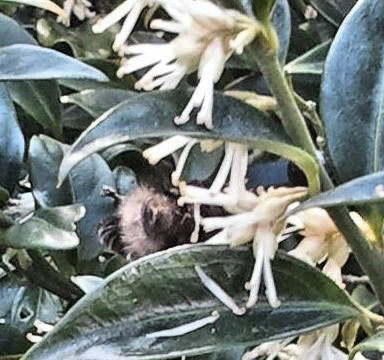 A few winters ago I saw a large early bumblebee being blown about Finsbury Park Station’s concrete concourse by a relentless wind. I offered it an open palm to crawl onto. Once it had settled there, I covered it lightly with the other hand, then carried it across Seven Sisters Road to the stairs leading up to Gillespie Park. In warmer months, wildflowers such as Buddleia – where a faded bee might be placed to revive itself with a drink of nectar – can usually be found flowering at the top of the stairs. But nothing was in bloom on this cold winter’s day. We carried on, walking along the path towards the Ecology Centre, with the wind blowing constantly across the railroad tracks & the bumblebee holding itself flat to my palm with all its strength. There were bumblebees of the same species visiting flowers on other nearby shrubs, drinking in the Christmas Box’s winter nectar. This was obviously THE place to come for early bees. 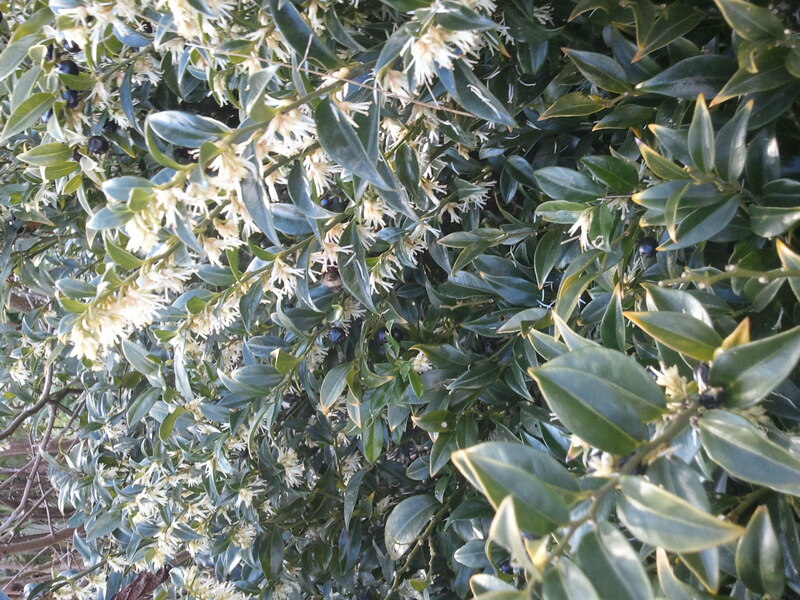 “Starting in February & throughout late winter, the little shrubs are covered with tiny creamy-white tubular flowers that release sufficient perfume to really spice up a shadily enclosed garden. Ours are planted at the entry to a shaded corridor-garden between house & garage, an area that holds in the perfume very nicely. Paghat’s Garden is a northwest Pacific US site, but she has much to share with those of us who live elsewhere.